← ….. Happy Birthday ! …..
….. finally ! 2 months on from the Yorkshire “Grand Depart”, my painting of the Leeds – Harrogate – Sheffield first 2 stages, is complete. The painting features all my personal favourite elements, (including some fantasy ones – retired greyhounds taking part in a vintage Skoda 🙂 …..) ….. 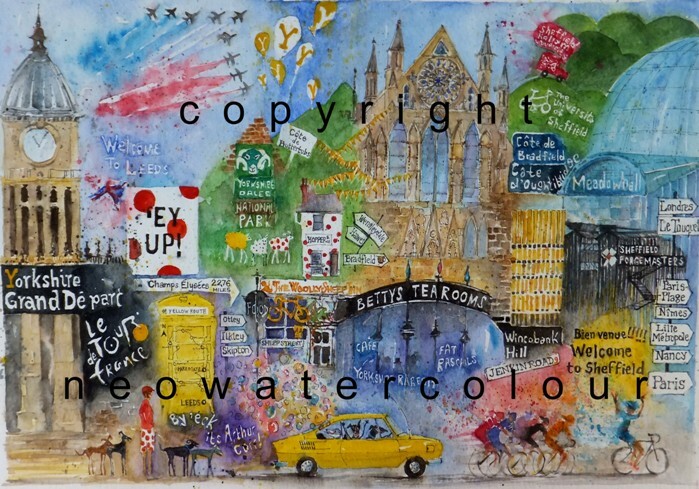 This entry was posted in Art, cars, Greyhounds, Sheffield, Sheffield - watercolours, UK and tagged 2014, Arts Tower, Bettys, Bradfield, Buttertubs, Cafe, Forgemasters, Grand Depart, greyhounds, Hallam, Harrogate, Hawes, Hopper, Jenkin Road, Leeds, Meadowhall, Nibali, Oughtibridge, Sheep, Sheffield, Skoda, Tea, Tour de Farnce, Town Hall, University, Wincobank, Yorkshire Dales. Bookmark the permalink. 14 Responses to ….. Phew ! ….. Tour de France ….. Yorkshire …..
Another gorgeous piece of work. I enjoyed watching the race and love the way you’ve depicted the cyclists. My good friend A asks whether he can buy a print please (with Aussie dollars or rumpled Scottish pounds). He is serious about adding to our Neo-Watercolour collection! Phew! What a beauty! Madness and delight. How much fun is Yorkshire (she asked rhetorically).. The painting is awesome. You have so much in it that I just don’t know how you do it!…Great work!